In 2009 I started this blog to promote my work as a documentary filmmaker and writer, the fruits of which are available as downloads and/or DVDs. If you’ve enjoyed my blog, I’m sure you’ll enjoy the work that inspired it. DVDs will be shipped overseas as well as domestically. Please order soon to have them arrive in time for the holidays. Regardless of one’s opinion about a romance between a man and his OS (let alone whether such a romance can be considered futuristic), “Her” is undeniably gorgeous to watch. It’s also the only film in recent memory to be set in a future that is livable, much less desirable. Instead of the dark, dystopian city of “Blade Runner,” we are dropped into a bright, orderly Los Angeles of tall buildings and excellent mass transit. Though single-family homes still exist, Theodore Twombly prefers a high-rise apartment, and is so well served by public transportation that he neither owns nor needs a car. Why would he, when trains and subways take him everywhere, including the beach and the mountains? In the near future of “Her,” Los Angeles has grown better as well as bigger. Shots of the Basin show a recognizable skyline, except that there are many more highrises in the areas between Downtown, Hollywood, Century City and Westwood, as there undoubtably will be in the years to come. These new buildings are CGI creations, but the jarringly smoggy scenes featuring elevated plazas and walkways were filmed in Shanghai. In them, one catches glimpses of the Bund, Shanghai’s riverfront commercial district, where old colonial buildings co-exist with new skyscrapers. And though Los Angeles will never have a navigable waterway, the broad curves of Huangpu offer a tantalizing suggestion of the future LA River. But many aspects of “Her” didn’t have to be imagined at all, since they already exist. Theodore makes extensive use the Metro, even if it doesn’t yet go all the way to the beach. And he lives in a real place: the South Park district of Downtown, on the 35th floor of the Watermarke Tower (705 W. 9th Street). 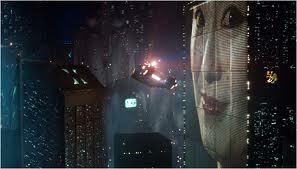 The buildings seen from his windows are all real buildings, shown to maximum advantage by the production designer K.K. Barrett, who covered the upper window panels and switched the glass from tinted to clear. Says Barrett, the “focus was to bring the outside city in, and push light towards [Theodore].” The resulting message is unmistakable: Theodore lives in the heart of a dynamic and desirable city. Though he is shy and lovelorn, his location confers an enviable status. In the photo above, Theodore is framed against a view of nine notable towers: (l-r) 777 Figueroa, Ernst + Young Plaza, PWC Plaza, Union Bank Plaza, HSBC, City National Plaza, Bank of America Plaza, AON and Verizon (MCI Plaza). Arguably, the real love story in “Her” is not between Theodore and his OS but the director Spike Jonze and Los Angeles. Having escaped both the dull suburban sprawl of its past and the ruins of its previously imagined future, Los Angeles appears a beautiful, modern and sustainable place. It’s obvious why Theodore, a dreamer of the first order, would want to live there, and why others would as well. Thanks to Ian McFarren Anderson for identifying the buildings seen from Theodore’s apartment. The New “Blade Runner”: Prequel or Sequel? Either Would Be Fine, Thanks! 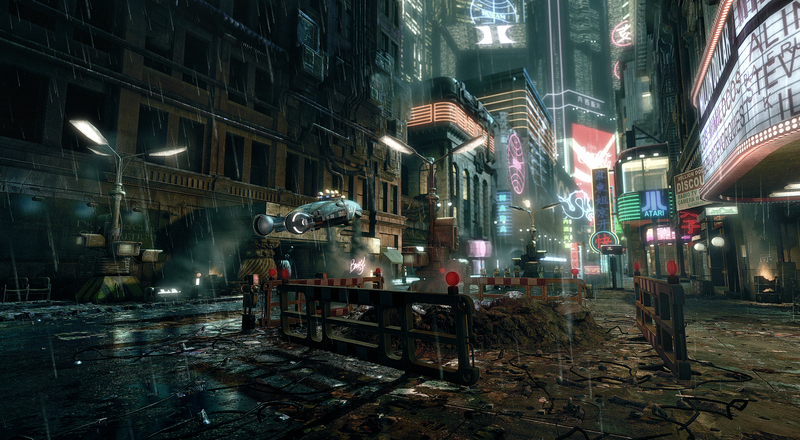 From the New York Times comes this tantalizing update on Ridley Scott’s forthcoming “Blade Runner” movie. Apparently we can’t call it a sequel, because it might not be. Who cares whether the new movie is set before or after the original? Just make it, and we’ll come out for it. You are currently browsing entries tagged with “Blade Runner” at Under the Hollywood Sign.